Townsend Walker’s twelve stories are rooted in foreign places, cemeteries, violence and strong women. The worlds his characters construct are unforgiving. Their paths cross in twisted and sometimes fatal ways. In the title novella, three women use wit, seduction, and weapons to master the men they meet. The ribald reverend in The Second Coming meets his match in 19 year-old Charity. In Super Secrets two women are neighbors and lovers, until one is betrayed and extracts revenge. On a darker note, a crazed horse and a storm at sea shatter a fragile love in Slashing at the Nets. Then, in Storm Painter an artist moves in with a writer, but their past destroys his third novel. Place is important. None other than an Italian detective would find a clue in a singularly shaped tortellini. The New York sniper would only be trained by the Israeli Defense Force. 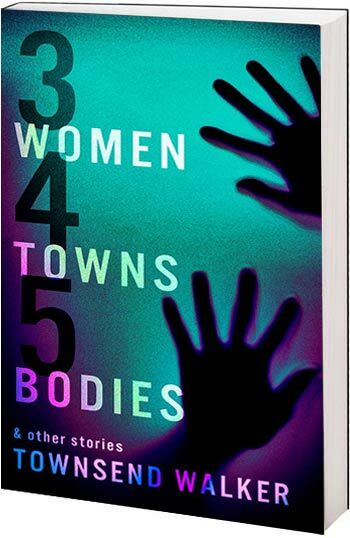 Written with crisp, precise prose, 3 Women, 4 Towns, 5 Bodies is a stylish and modern take on noir fiction. These stories portray a world that is glamorous, mysterious, a bit seedy, and thoroughly compelling. Fans of Raymond Chandler and Elmore Leonard will love the sparkling dialogue and dry wit. If you like your plots hard-boiled, your romances illicit, and your beautiful dames worldly and sharp as their murder weapons, look no farther than this fast-paced collection of gleeful tales of trickery, murder and slow-simmered revenge. Set in lush locations as varied as 1960’s NYC, revival tents in 1928 Texas, and a mountain village in 1839 Hungary, these fascinating morally ambiguous stories will be just your cup of tea….or glass of fizzy champagne. Or claret. Or port…. Townsend Walker’s collection of riveting stories reflects the imagination of a life well-lived. The characters are sharply drawn and as varied as the plots and places. I enjoyed these stories. They make for exciting and fast paced reading. An impeccably written collection of stories–each one different, but somehow creating the same effect. The dark tone, the morally ambiguous characters, and the vivid imagination of the author make this collection worthy of a permanent place on the bookshelf.